PESHAWAR, Pakistan , Nov 20 2014 (IPS) - Balwan Singh, an 84-year-old shopkeeper living in Pakistan’s northern Khyber Pakhtunkhwa province, is well past retirement age, but any illusions he may have had about living out his golden years in peace and security have long since been dashed. The elderly man is a member of Pakistan’s 40,000-member Sikh community, which has a long history in this South Asian nation of 182 million people. Though constituting only a tiny minority, Sikhs feel a strong pull towards the country, believed to be the birthplace of Guru Nanak, the founder of Sikhism. 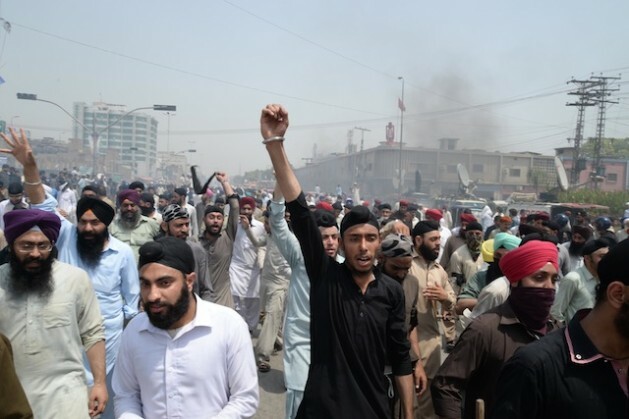 Sikhs have lived on the Afghan-Pakistan border among Pashto-speaking tribes since the 17th century, but in the last decade the Federally Administered Tribal Areas (FATA) – once a cradle of safety for Sikhs fleeing religious persecution – have become a hostile, violent, and sometimes deadly place for the religious community. For many, the situation now is a veritable return to the dark ages of religious persecution. Today, Balwan is just one of many Sikhs who have abandoned their homes and businesses in FATA and taken refuge in the neighbouring Khyber Pakhtunkhwa (KP) province. “We are extremely concerned over the safety of our belongings, including properties back home,” Balwan, who now runs a grocery store in KP’s capital, Peshawar, tells IPS. Balwan is registered here as an Internally Displaced Person (IDP), along with 200,000 others who have left FATA in waves since militant groups began exerting their control over the region in 2001. Calling Sikhs ‘infidels’, the Taliban and other armed groups set off a wave of hostility towards the community. Shops have been destroyed and several people have been kidnapped. Others have been threatened and forced to pay a tax levied on “non-Muslims” by Islamic groups in the area. According to police records, eight Sikhs have been killed in the past year and a half alone. When Balwan arrived here in Peshawar, he was one of just 5,000 people seeking safety. Karan Singh, another Sikh originally hailing from Khyber Agency, one of seven agencies that comprise FATA, says that requests to the government to assist with their safe return have fallen on deaf ears. “Maybe the government doesn’t grant us permission to go back because it doesn’t want to enrage the Taliban,” speculates Karan, also an IDP now living in Khyber Pakhtunkhwa. Indeed, many Sikhs were business owners, contributing greatly to the economy of northern Pakistan. Now, hundreds of shops lie abandoned, slowly accumulating a layer of dust and grime from neglect, and scores of Sikhs are reliant on government aid. The average family needs about 500 dollars a month to survive, a far greater sum than the 200-dollar assistance package that currently comes their way. The situation took a turn for the worse in June of this year, when a government-sponsored offensive in North Waziristan Agency, aimed at rooting out militants once and for all from their stronghold, forced scores of people to flee their homes amidst bombs and shelling. Some 500 Sikh families were among those escaping to Peshawar. Now, they are living in makeshift camps, unable to earn a living, access medical supplies and facilities or send their children to school. Male children in particular are vulnerable, easily identifiable by their traditional headdress. While some families are being moved out and resettled, Sikhs say they are consistently overlooked. “We have been visiting registration points established by the government to facilitate our repatriation, to no avail,” Karan laments. Such discrimination, experts say, is not conducive to a pluralistic society. According to Muhammad Rafiq, a professor with the history department at the University of Peshawar, Sikhs are the largest religious minority in Pakistan after Hindus and Christians. Thus the current situation bodes badly for “religious harmony and peaceful coexistence in the country”, he tells IPS. He says that minorities have to contend not only with the Taliban but also Islamic fundamentalists who regard any non-Muslim as a threat to their religion. By this same logic, Hindus and Christians have faced similar problems: threats, evictions and, sometimes, violent intimidation. Kidnapping for ransom has also emerged as a major issue, with some 10 Sikhs being kidnapped in the past year alone, prompting many to pack up their belongings and head for cities like Peshawar, says Lahore-based Sardar Bishon Singh, former president of the Pakistan Sikh Gurdwara Parbandhak Committee (PSGPC). Bishon’s shop in Lahore, capital of the Punjab province, was looted in September 2013, but he says the police didn’t even register his report. “Thieves broke into my shop and took away 80,000 dollars [about eight million rupees] but the Lahore police were reluctant to register a case,” Bishon recalls. Some experts say the problem runs deeper than religious persecution in Pakistan’s troubled tribal areas, extending into the very roots of Pakistan’s political system. “The constitution limits the political rights of Pakistan’s non-Muslims,” says Javid Shah, a Lahore-based lawyer. He believes these clauses in the constitution have “emboldened” the people of Pakistan to treat minorities as second-class citizens. This mindset was visible on Aug. 6 when a Sikh trader, Jagmohan Singh, was killed and two others injured in an attack on a marketplace in Peshawar. He alleges that the gunmen, who arrived on a motorbike, did not face any resistance when they rode in to the marketplace. “Police arrived after the gunmen had left the scene,” he adds. On Mar. 14 this year, two Sikhs were killed in the Charsadda district in Khyber Pakhtunkhwa but their killers are yet to be identified, Pram says. While eyewitness accounts point to negligence on the part of the authorities, some believe that the government is doing its best to address the situation. Sardar Sooran Singh, a lawmaker in KP, insists that the government is providing security to members of the Sikh community, who he says enjoy equal rights as Muslims citizens. Peshawar Police Chief Najibullah Khan tells IPS that they have been patrolling markets in the city where Sikh-owned shops might be vulnerable to attack. “We have also suggested that they avoid venturing out at night, and inform the police about any threat [to their safety],” he says. Into the valley of death rode the 500….the Kkyber Pass……the British once had an empire on which the sun never set, now Hollywood has come into this empire and seeks to firm up and expand it’s firmness of control by getting it’s L.A. product into Pakistan and everywhere else. But, people all over the world are becoming alert to this Evil Entertainment Empire, and, like the Taliban, are resisting, sometimes even by refusing to watch TV, as many Muslims in Pakistan practice. Stupid it was British India not your Modi endia LOL So stop caliming it yours. Did you rule at that time? Irony is that Mughals were the rulers before Britisher in India so I think I should say India is ours.